FUN FACT: The only aisle inside the supermarket that take most of my time whenever we shop for our groceries is at the canned goods section. I love eating tuna, it's my default comfort food at home. There are so many brands of canned tuna in the market today and there were times I'm confused what to pick. I'm the type who always read labels, checking the ingredients and nutrition facts at the back of the packaging. I was invited to the launch of Mega Tuna, one brand of canned tuna that I see in the supermarket shelves. To tell you honestly, I prefer another brand of tuna because it's the brand that we used to buy over and over again. But after the launch of Mega Tuna, I think I'll be a convert because the brand is made of 100% PURE TUNA. To know more about the brand and their new ambassador, scroll down please. Created this simple tuna salad using Mega Tuna flakes in Oil during the launch. 100% Pure tuna goodness! Mega Global Corporation, the Philippines’ top manufacturer and distributor of canned goods has recently launched Mega Tuna, their newest addition to their line of premium products namely Mega Sardines, Mega Creations, Valley Farm, and Oh my Ulam!. With their vision set in providing high-quality, value-for-money products through bringing forth improvement and innovation in fishing, food technology and packaging, Mega Global has set a high standard in providing all 100% pure tuna in every variant of Mega Tuna. During the event, Raffy Lantin, AVP for Sales and Marketing of Mega Global Corporation has expressed the company’s excitement over the launch of this new world-class product from MFC. The promised of this new product is ALL variants of Mega Tuna contains 100% pure tuna with no extenders, no preservatives and no MSG. Great! After hearing what he said, I immediately get one can of tuna and read the back label. I saw that it doesn't contain other preservatives and it only contains around 200 mg of sodium. No extenders- does not utilize Textured Vegetable Protein (TVP). It comes in an easy-to-open can. Once you open a can of Mega Tuna, you'll see tuna flakes filling most of the can. Cheaper than the leading brand. 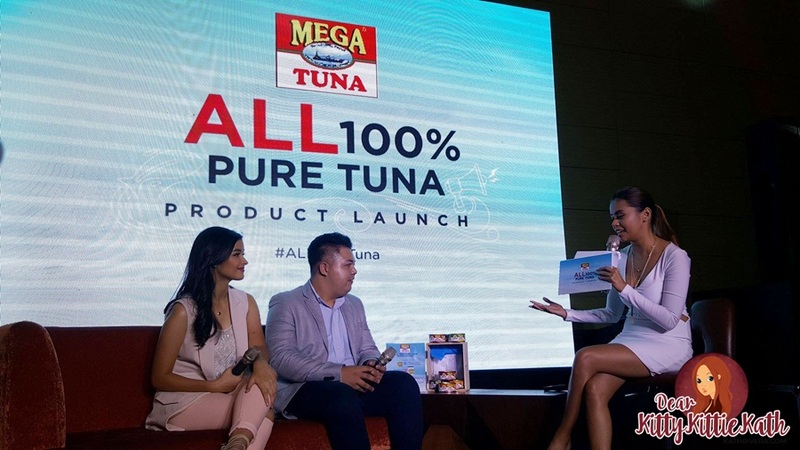 During the event, Mega Tuna also introduced their latest endorser, teen superstar Liza Soberano who the brand sees as the personification of Mega Tuna: naturally 100% beautiful inside and out. “We are very excited to work with Liza whose beauty and personality captures the heart, who gives her 100% in everything she does, whether it is with her showbiz career, her advocacy and most especially with her family. We are very confident with Liza for Mega Tuna.”, Calona said. 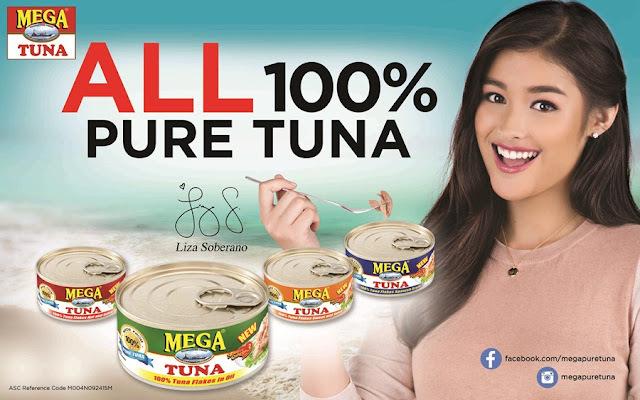 Mega Tuna is available in all leading supermarkets and groceries nationwide at the suggested retail price of P33.10. 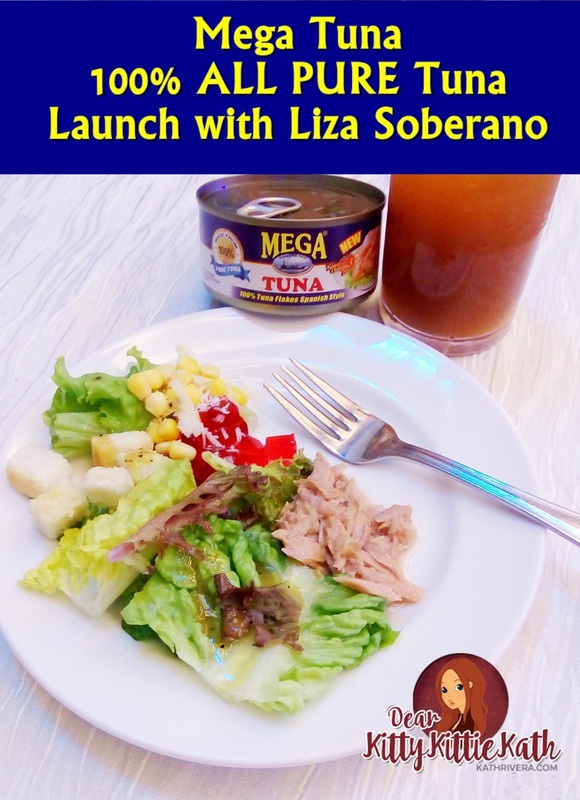 You can also watch Liza Soberano's Mega Tuna webisodes in their Facebook page.